While it is important to accept life as it is, there is a catch. 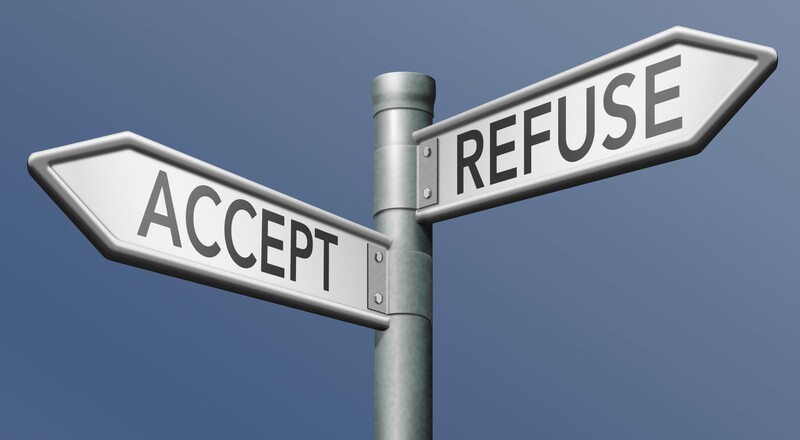 Acceptance implies that I am fully conscious and aware of how things really are, but I need not placidly yield if I perceive detrimental conditions that can be corrected or injustices that can be set right. Acceptance does not mean that I am a doormat. Acceptance does not mean that I roll over and do nothing. In the Serenity Prayer, so commonly heard in the rooms of recovery, we pray for the serenity to accept those things we cannot change. There are those who misconstrue this phrase as an implicit OK to resign themselves to their “fate.” Blinded by their disease, they twist acceptance into defeatism. In an abusive relationship? I must accept that and stay. Is a felony conviction keeping me from my chosen career? I’ll go on the dole. The list is endless. How mistaken a defeatist mindset is. Do we not also pray for the courage to change the things we can and the wisdom to know the difference? What if Martin Luther King or Mahatma Gandhi passively accepted the injustices they encountered? They cowered to no one. Instead, they acknowledge their respective situations but then tapped into the courage and fortitude needed to move beyond their present state. It’s been said that you can’t change the wind, but you can adjust the sails. I learned this first hand during a summer spent navigating a small sailboat in and around the harbor and coastline at Newport Beach, CA. When I first started sailing, the easiest course of action was to just go with the wind. If the wind was blowing south, I went south. But with some practice, I learned a maneuver called “tacking.” By adjusting my sails and making regular corrections, I could sail almost directly into the wind. The direction of the wind did not dictate where I was headed. Like in life, however, conditions often changed suddenly and dramatically. Did I resist? Do I fight? Did I panic? When the wind whipped up or changed direction, the worst thing I could do was to fight it or panic. Fighting the wind is futile. That was an early lesson in powers greater than me. Panic causes tunnel vision and, as I learned on occasion, that can lead to capsizing. But if I calmly accepted the dangerous conditions I could see more clearly how to adjust the sails, correct course and sail smoothly. Life in general is that way. Conditions change. Acceptance isn’t a one-an-done deal. As I slumped into the downswing of depression that invariably follows mania, I wasted months trying to recreate the past in my head. The few times I came close to acknowledging what had happened, I had delusional dreams of winning the lottery so I could smooth over damaged relationships with money—hardly a healthy state of mind. To pull out of the depression I had to first accept what had happened so I could more maturely deal with the consequences. It didn’t happen overnight. But as I accepted what I had done I put myself in the position to make amends and start piecing my life back together. Acceptance is not conditional. I don’t have to demand that there be mutual acceptance before there is acceptance on my part. In Twelve-Step recovery there is an emphasis on keeping your own side of the street clean. In other words, do what you can about improving your own situation without making it conditional on what the other party does. Acceptance has to come from within. For me it is more often a heart-felt, gentle easing in to an accepting state rather than an intellectual exercise. The rapidly churning hamster wheel in my brain is often the last part of me that accepts anything. I saw this first hand when I was taking a long walk to contemplate why there are so many tragedies and calamities in the world. I walked for miles, all the way praying to understand Universal Design. How was I to surrender to a Higher Power when I saw the world as an ugly, hostile place? I got my answer. I came to know, like a parent knows that children will learn from their struggles, that the design was perfect in terms of my eternal progression. I saw that much of what goes awry in this world is due to people poorly acting upon their free will. I saw that God neither grants lottery wishes nor flies planes into buildings. I saw sickness and disease as part of the nature of an imperfect, evolving world–not something that is inflicted by a Divine force. I saw that much of my problem with the concept of God was that I mistakenly saw God as some Grand Meddler in human affairs. Seeing God as the source of divine law instead of a capricious busy body helped. As I relaxed into acceptance, I remembered hearing in the rooms that life is a school… and class is in session. I understood at a deeper level that God does not will pain and struggles, but that God is a source of power to be relied on to bring you through such trials. I reflected on how often pain can be our greatest teacher. If not resisted, pain does not necessitate we suffer. As Haruki Murakami famously wrote: “Pain is inevitable. Suffering is optional. I remembered how passing through pain, especially emotional pain, often was the precursor to some of the deepest joy I ever felt. Trapped for years, for example, in alcoholic agony, the release from that pain was highlighted with joyous memories of acceptance, faith and surrender. For years I chased mere pleasure in a vain attempt to avoid pain. Pleasure—soul sickening in excess, a pleasant respite in moderation–never led to the joy that overcoming a painful situation did. These are just a few of the points I reflected on… it was a long walk. But at a deep level, my answer to why this world is the way it is was far more a relaxing into acceptance of the way things are then an intellectual awakening that I could layout in a written treatise.